A memorial garden lives on. Live plants, by their nature, can provide soothing comfort to you during your bereavement, while providing many years of pleasant improvement to your landscape. Pick a quiet corner or spot in which to construct your special garden. You will need to select a focal point for the project. Good choices would be a memorial bench, fountain, sundial, large special rose bush or small accent tree. 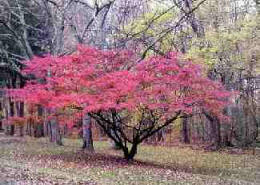 Some really beautiful small specimen trees are: flowering dogwood (pink or white), Japanese maple or Japanese flowering cherry. If you wish to just plant one solitary memorial tree, visit this page for some project ideas and interesting tree-planting options: PLANT A MEMORIAL TREE. You might even consider installing a small pond in your garden as well. Home improvement centers sell pond liner kits complete with instructions. If you include a small fountain or waterfall, the sound of running water can be very soothing. Solar pumps are available which allows you to place the pond away from the house. Pick up a book or two on ponds before taking on a project like this, it's pretty ambitious. 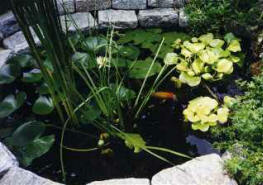 But if you are fairly handy with home/garden projects, a pond can provide a fascinating and rewarding new hobby for you. 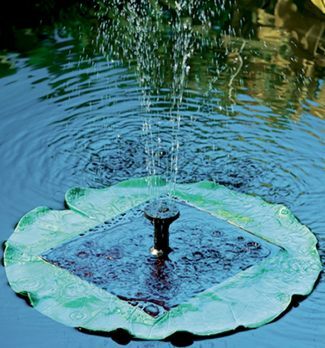 Aerate your pond by simply drifting this solar-powered fountain on the surface. 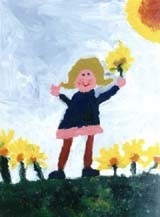 In direct sunlight it will send a continuous, gentle spray into the air at heights up to seventeen inches. No wiring or operating costs are involved! Another idea for a focal point would be a statue or concrete figurine. 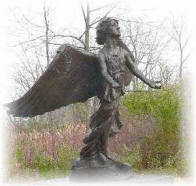 One favorite for a memorial garden is a cast concrete angel or cherub. To find your special statue, look in the yellow pages for "concrete products" or "statuary". Home improvement centers also sell them. Once you have the focal point or "centerpiece" of your memorial garden, plan for some small shrubs and flower beds. Select plants you know your lost one loved, such as roses, lilacs or jasmine. Use evergreen azaleas or rhododendrons to provide backdrop and round out the display. For the flowerbeds, consider "bleeding heart", "forget-me-nots", tulip bulbs, violets or violas, daffodils, lilies of the valley or even sunflowers. 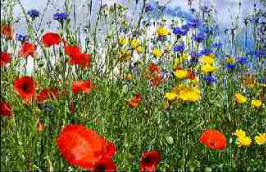 You also might consider planting a wildflower plot or an elegant butterfly garden to honor your lost loved one. (See more on butterfly gardens below). For a walkway, you might lay down mulch, bagged stones or gravel, or even construct a plank walkway out of pressure-treated wood. Personalized stepping stones can also add just the right touch (offered below). Part of the therapy of this project is the planning and creation of it. Immerse yourself in this worthy new project! Your memorial might not end up on the cover of Home & Garden magazine, but it's yours! Your loved one would be honored by your tribute to him or her. And you will end up with a special place for quiet reflection or prayer... a lovely spot to remember your lost angel. 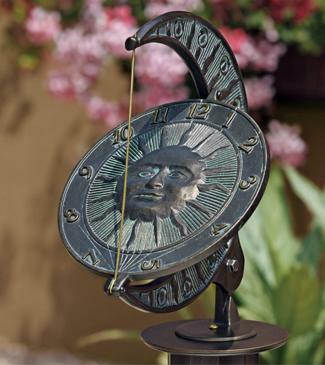 This impressive sundial brings both the sun and moon to the ancient art of telling time. Ready to withstand any conditions, it is hand-crafted of weighty, cast aluminum with antique-bronze, powder-coat finish. Shown on Hand-Cast Aluminum Pedestal. (Pedestal sold separately). 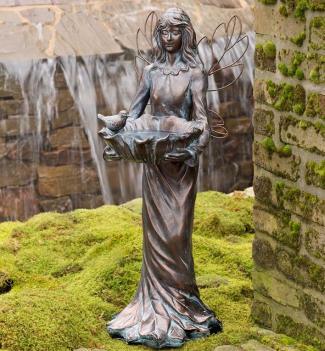 Quite a graceful sight, our Sunflower Fairy Birdbath features a bronze-colored, weatherproof finish. This beautiful fairy carries a shallow, sunflower bowl that invites birds to rest and take a refreshing bath. Crafted of resin and stone powder, this enchanting birdbath has the look of stone without the weight. 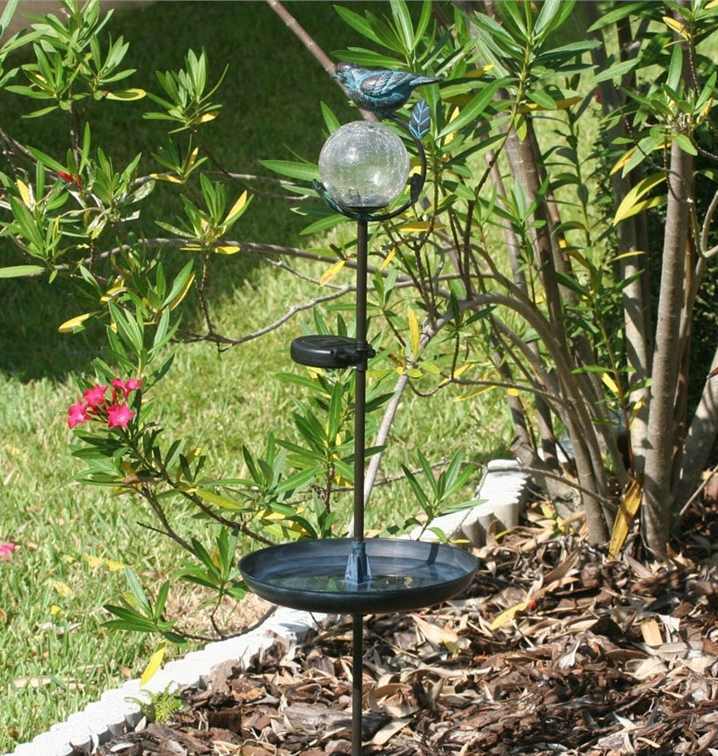 Aquarius Solar Stake Birdbath With Glowing Glass Orb doubles as a glowing garden accent. Solar panel absorbs the sun's energy by day to give you color-changing illumination at night. What a relaxing and attractive water feature to have either inside or on a covered patio. Set in a sturdy resin base, our Large Bronze Leaf Fountain features interwoven metal leaves that deliver a never-ending peaceful waterfall. Easy assembly, pump included. 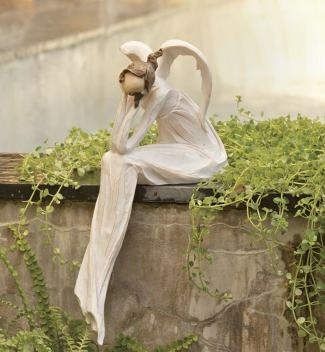 Her head softly tilted, our Thinking Angel Garden Statue is sitting serenely, pondering the world below. Sitting elegantly on any shelf, mantel, garden wall ledge, porch or deck, this lovely angel accent can be placed indoors or out. 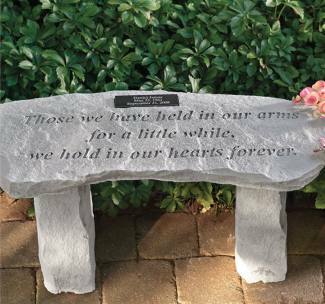 Pay tribute to a loved one by dedicating a classic resting place in the garden with our inscribed, hand-cast stone bench. Space is provided for an optional, personalized marble plaque. Handcrafted in Pennsylvania. 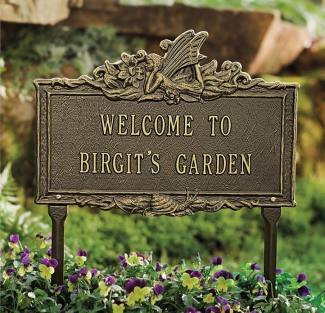 Add a personal touch to your memorial garden by displaying a customized plaque. Crafted of weather-durable cast aluminum with powder-coat finishes; includes two 18" lawn stakes. Made in USA. 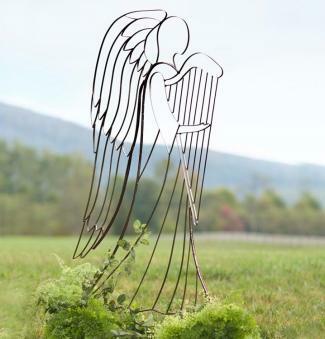 Train some ivy up this Angel Garden Trellis to create an eye-catching tribute to your lost loved one. Over five feet tall, this sturdy metal trellis comes with ground stakes for extra stability. Even without a climbing plant display, the trellis will make an elegant sculpture for your yard. Naturally smooth river rocks offer durability and organic beauty in our Zen-inspired stepping stones. 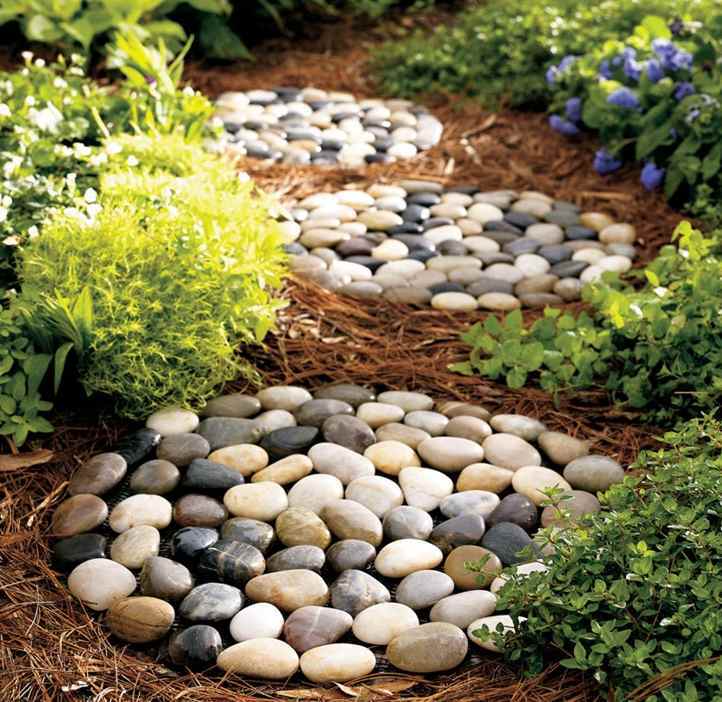 Stepping stones have a water-resistant, PVC backing that allows soil to settle between stones. Each piece is an original. Set of three. 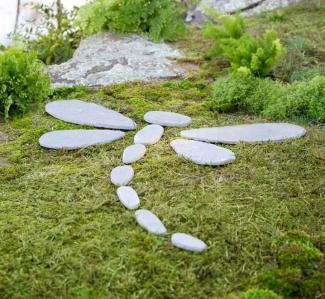 Add character to your memorial garden with our Dragonfly Garden Stones Accent. Each of these 12 weather-durable, cast stone pieces has a material backing. Place a charming dragonfly in the center of your project for an eye-catching accent. Our Glass Hummingbird Feeder in Four Victorian Mini Blossom style is just as bright and vivid as the hummingbirds it feeds. 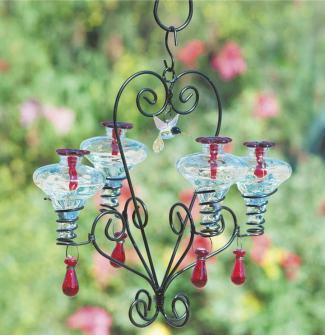 A delicate glass hummingbird hangs from the top of the feeder and adds the final elegant touch to accentuate your yard décor. 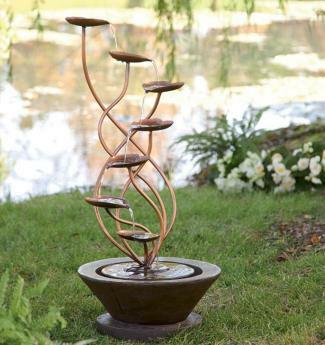 Attract beautiful songbirds to your garden with this Tower Seed Metal Bird Feeder. 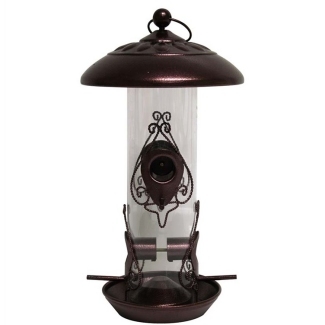 Molded from steel with a durable plastic center tube, this decorative mixed seed bird feeder has hammered, copper-colored accents. Simple to hang from any tree, porch, deck or shepherd's hook. The handcrafted steel helix in our Hanging Glowing Spiral Spinner rotates effortlessly around a hand-blown, artistic glass globe in even the slightest breeze. Luminescent crystals in the brilliant glass globe absorb the sun's energy during the day to release a soft green glow at night. 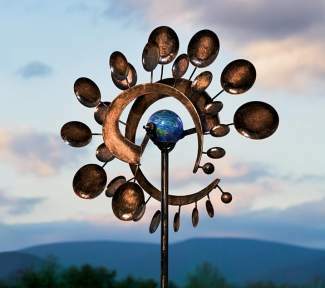 Our Illuminarie Dual-Motion Windwheel adds an interesting touch to your memorial garden. The spinner wheels rock and rotate around a glow-in-the-dark beautifully colored globe in the center. 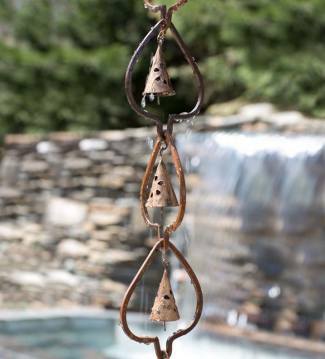 Bringing beauty and soothing tones to your outdoor retreat, our Meditation Bells Wind Chime is crafted in India from solid iron. Every time the breeze blows the relaxing, "Zen" sound that escapes these artistic garden bells will send peaceful energy around your garden or patio. 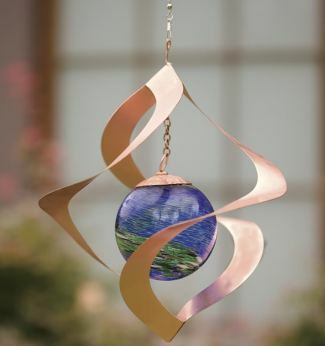 You'll love this Swirled Iron Bells Wind Chime's elegant design, but just wait till you hear its soothing sound! 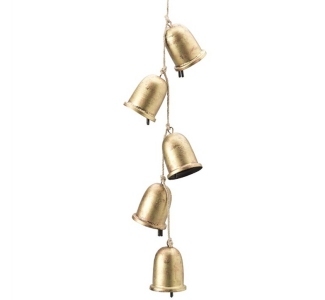 Crafted in India of durable iron with a copper-colored finish, this chime features seventeen petite temple bells accenting an artistic scrolled base. 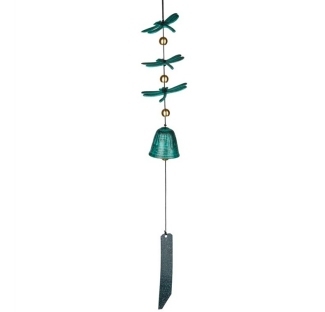 Three flying dragonflies grace this Verdigris Aluminum wind bell. When the wind catches the rectangular clapper, it'll send light and lilting tones across your garden. Durable and lasting in any weather. 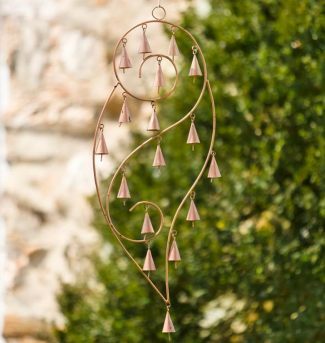 Your garden will embrace rainy days with this soft and sweet-sounding Steel Leaf Rain Chain With Temple Bells hanging from your home's nearby soffit or eave. Hang this leaf rain chain over a drain or basin if you want to collect rainwater. 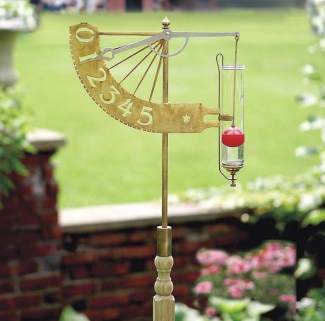 Brass Jeffersonian Rain Gauge is sure to catch the eye of garden visitors. This extraordinary outdoor rain gauge is interesting and functional while offering an artistic accent to your favorite garden retreat. 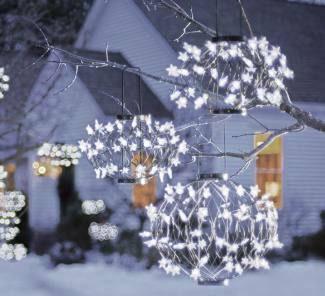 Turn your garden into a nighttime retreat with these Solar-Powered Lighted Starballs! They collapse into a long column for storage (and can even be displayed that way, if you like) and you pop them into ball shapes to place on your lawn, porch or patio. Another very special memorial garden, usually most appropriate for a woman or little girl, is a butterfly garden. This involves plantings of special flowers and shrubs that are known to attract butterflies. 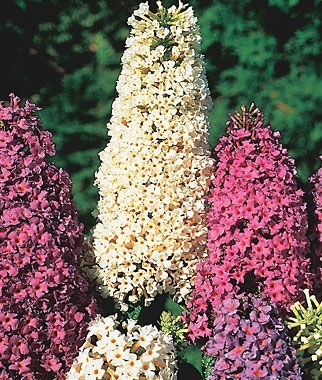 One especially attractive to butterflies is the Butterfly Bush. 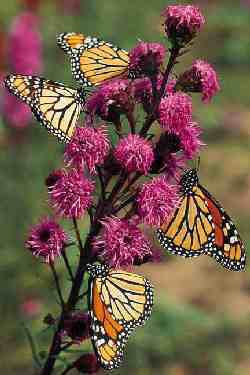 We found a great website that tells you exactly how to plan and plant a gorgeous butterfly garden. Get started today with this great resource: Glorious Butterfly.